The video was a little teaser (probably mostly for myself) as I have been looking for this for a while now, hoping not to pay silly prices for it. 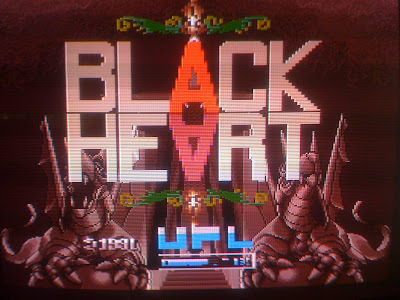 Black Heart is a cute-em-up designed by NMK and released by UPL and its a super fun early 1990's STG with a swords and sorcery theme. It's got a great OST, matching the lightheartedness of the game and pace really well. This happens to be the Japan version, which does not have autofire built in, which I really don't mind at the moment. It seems doable without autofire, but I will be getting an autofire pcb from rancor shortly anyway. The pcb was misslabeled on ebay as 'Black Hert' and I happened to stumble across it just looking through all the pcb boards. It does have a small bit of sprite corruption, but the seller has already agreed to pay for the repair costs and it will be going back to channelmaniac (guy who repaiured my Battle Garegga and Twin Cobra) as soon as he gets back from a work trip.